Challenge: To produce a personalised box as a gift that is able to be used as a storage box. Background: Student had produced a series of basic prints, and was looking at producing a gift for a family member. She wanted to personalise the box with the name of the person it was intended for. Level of Difficulty: Medium. 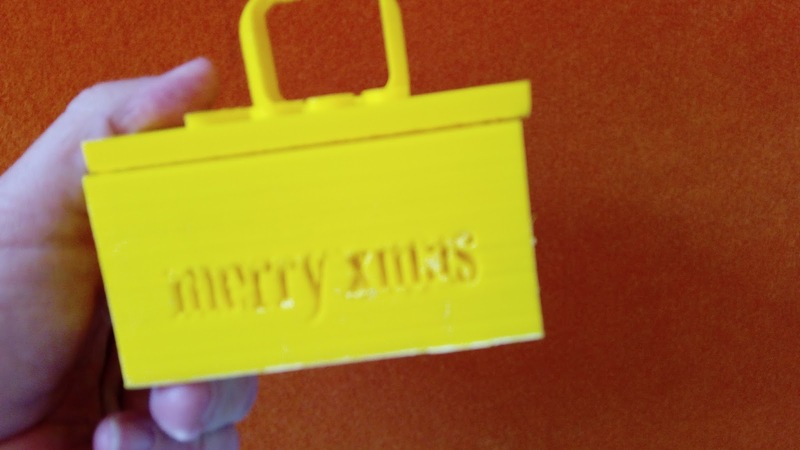 Tinkercad interface was used to produce the box shape. 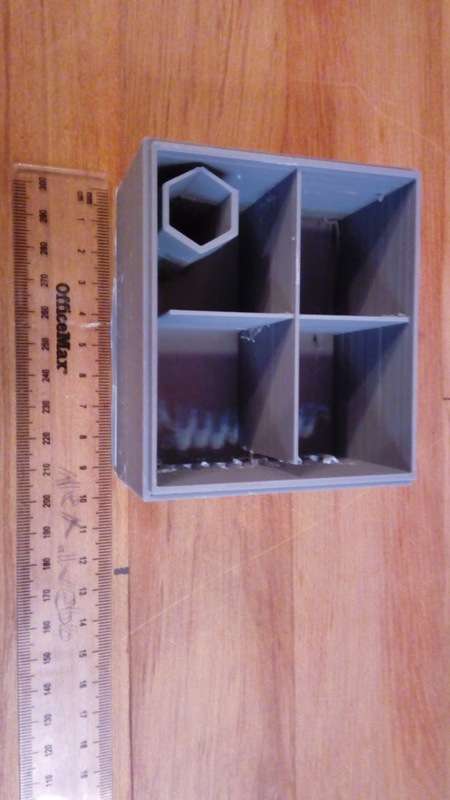 Student added additional features to the box to divide it into different areas and experimented with adding the hexagonal featured storage shape shown in the photograph. The personalisation of the box took the form of lettering that was sunk into two sides of the base of the box - which was not successful. (see below). Timeframe: Eight hours. The width of the sides (see below) should have been increased to provide more strength and depth to the sides of the box. The student ultimately decided not to produce a lid for this box as they wanted the box to be a stand alone design. Size: 8cm long by 9cm high. The box was 5cm high. The external wall of the box was 5mm. The internal walls (shown in illustrations) were thinned to 1-2mm. What we would do differently: The internal walls were too thin. At 2mm they were not strong enough. While they have not yet broken the strength is clearly not there in basic testing. In addition at two points the internal wall stops short of touching the main external wall. This was created by student Tinkering. The lettering on the external side of the box was not successful. 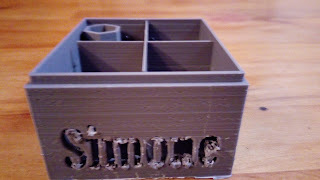 The name of the gift for the student ('Simone') was sunk deep into the base, when it was removed not all the materail could be successfully taken out, and the lettering itself was damaged. 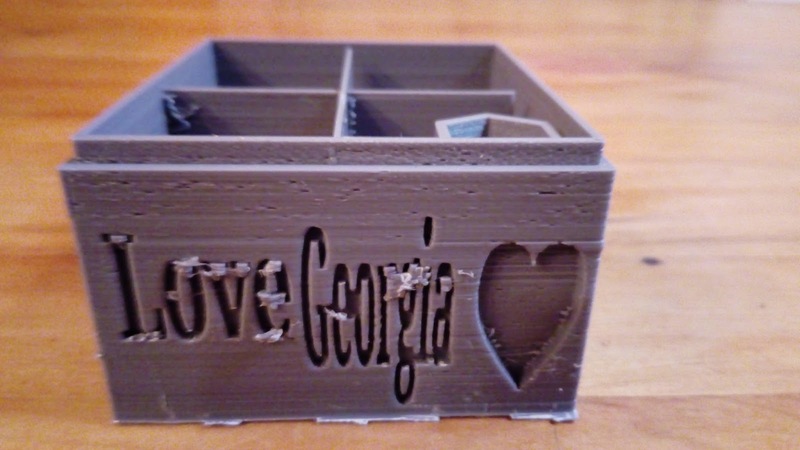 With the 'Love Georgia' inscription as shown clearly in the photograph above most of the filament rafting was removed easily, however there was filament that could not be removed as requires an additional tool to do so. The reverse side, shown below, when the rafting was carefully removed by the student resulted in damage to the font and the lettering. The lettering in this case was sunk too deep into the base of the box and lacked enough robust support for it to be shaped successfully. Next steps for the student: As mentioned in previous prints the design/ideas and format for boxes has been nearly exhausted by the students/classrooms efforts. Students (in this case a ten year old) have produced a variety of boxes and details of which have been increasingly detailed and complicated. 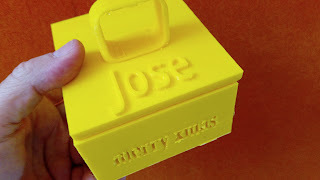 Challenge - To produce a Christmas theme gift box with a working lid, personalised for the person that it was intended to be for. Background: Student was attempting an advanced print for the first time. They had completed basic designs but this was the first attempt to involve using the 3D Printer to produce an object with parts that related to each other (in this case the lid, with a drop down base and ensuring that both parts worked in unison with each other. Level of Difficulty: Medium. The box as shown in the illustration included a lid, with the name of the person that it was gifted for. It included a handle that is clearly shown above, with rafting removed. The base of the design included lettering themed with 'merry xmas' as it was intended as a seasonal gift. 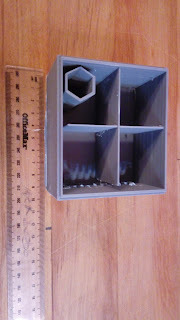 The 'box' template that was used came from the Tinkercad main interface. Timeframe: Fifteen hours for the base and the lid combined. The width of the lid was 5mm and the handle potentially could have been lower, however redesigning the box would not have been possible to reduce the printing time. 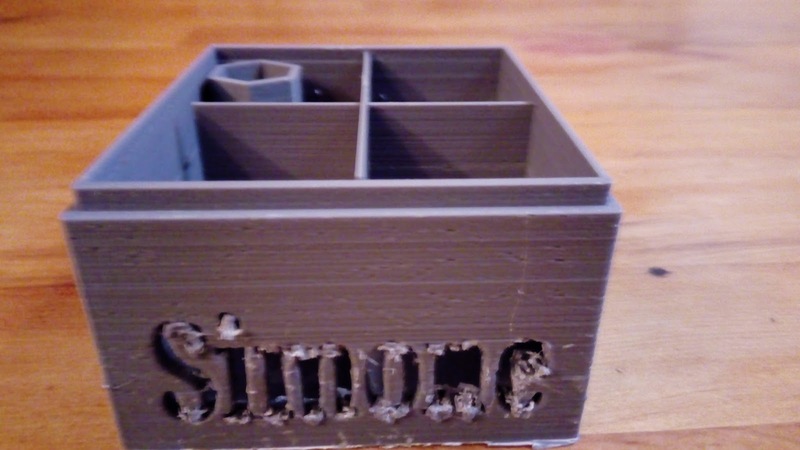 An 8mm nozzle was used for the print, which ensure that the time was probably the minimum that would have been required to produce a print of this size and design. What we would do differently: As shown in the photograph above the lettering in the base of the box was dropped into the design. In removing the filament around the lettering it is extremely difficult to remove it succesfully without causing part of the font to be removed (such as the middle m stroke in the 'merry' part of the design). We have tried a variety of tools to remove this successfully and are still searching for the best soultion, it is particularly difficult given the size of the font. Potentially the font could have been increased in size. Next Steps of students: Student is now able to confidently produce and make boxes of medium difficulty. Student will be encouraged to move onto more challenging and varied designs. Student could mentor others to produce this sort of design and also variations of it.